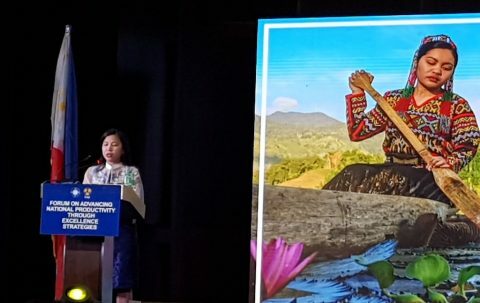 (Eagle News) — More than 100 participants from member economies of the Asia Productivity Organization (APO) and Philippine public and private sector organizations attended the “Forum on Advancing National Productivity through Excellence Strategies” at the Marriott Hotel, Pasay City on April 12, 2019. The forum featured three international speakers who shared their experiences in the implementation of the APO Center of Excellence (COE) programs: Green Productivity (Taiwan), IT for Industry 4.0 (India), and Business Excellence (Singapore). They were Eugene Yu-Ying Lin, Director, China Productivity Center, Amita Prasad, Director-General, National Productivity Council of India, and Michael Tan, CEO and NPO Head, Singapore Productivity Association. Director for planning services of the Department of Public Works and Highways, Engr. Constante Llanes Jr. also gave a special presentation on the government’s Build, Build, Build Program. However, the study also warns that there’s no guarantee this upward trajectory will continue if leaders are unable to manage multiple risks, such as growing inequality within countries, intense competition for limited natural resources, and corruption at various levels of government. Given these challenges, she says, the APO has to look for ways in order for it to advance its productivity mission to make this “Asian century concept” a reality. The APO Center of Excellence (COE) program allows the best practices of a national productivity organization (NPO) in a specialized area to be emulated by other NPOs. The scope of a COE includes sharing knowledge and methods through training, workshops, and study missions. An APO COE is a formally designated institution or network of institutions in a member economy which has achieved a world class level of competency, with exemplary performance and experience, in a specific body of knowledge or area that contributes to productivity. The Philippines was designated as APO COE on Public Sector Productivity in 2015.